Esotico is dedicated to providing healthy, flavorful ingredients in their fresh pasta. Inspired by a love of pasta and fresh vegetables, Pati and George Harris and Julie and Wayne Huisman founded Esotico, LLC. With their gardening background they envisioned the creation of fresh pasta infused with the wonderful flavors from their gardens. So good you don't need sauce! 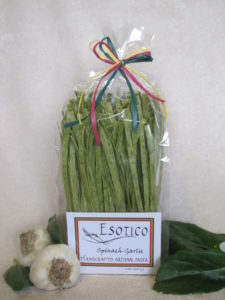 Esotico is dedicated to providing healthy, flavorful ingredients. As often as possible, those ingredients will also be fresh and from their own gardens, grown without harmful insecticides or chemicals. The pasta flavors will often vary based upon what is in season.